Brig. Gen. Ulysses S. Grant has returned to Fort Donelson after visiting Nashville, now held by elements of Buell’s Army of the Ohio. Just as Grant was leaving, he met Buell at the edge of the Cumberland River and learned that the retreating Confederate forces are now thought to be at Murfreesborough, about 30 miles away, weakened and offering a tempting target. Always ready to advance, Grant writes Halleck’s headquarters, “I will hold my force in readiness for a move on very short notice.” Grant has no idea that the wrath of Halleck will descend on his head very shortly. 1. “There will be bayonet exercise…from nine to ten a.m. and battalion drill from eleven to twelve. 2. “At four p.m….the regimental grounds [will] be thoroughly policed under direction of the officer of the day. Hazen halts at the St. Cloud Hotel, where the host, a Mr. Carter, invited the colonel and his staff for drinks at his bar. Carter “tasted everything first…to assure us.” Out of curiosity, Hazen examines the hotel’s register, discovering his immediate predecessor was William Babcock of Illinois, “a cousin I had not seen since a child of three years, and never since.” Throughout the war, symbolic incidents like these will remind soldiers North and South again and again how closely they were related, whether by blood or in spirit—fellow Americans all. ELSEWHERE IN THE CIVIL WAR: In Richmond, the Confederate capital, the bitter words of politicians reflect the Confederacy’s anxiety over the losses in Tennessee. The people’s representatives are angry and demanding investigation into the performance of their generals and even President Jefferson Davis. Ordered by Maj. Gen. Henry W. Halleck not to move on Nashville, Brig. Gen. Ulysses S. Grant waits impatiently at Fort Donelson, handling the routine duties required by a large encamped army. Between chores Grant writes his wife, Julia, telling her that Gen. Albert Sidney Johnston, the Confederacy’s western commander, has “fallen back about forty miles south from Nashville leaving the river clear to our troops.” Grant has already ordered some of Buell’s troops—without Buell’s knowledge—to move up the Cumberland on steamboats, preceded by a gunboat. If Grant himself can’t advance on Nashville, he will make sure somebody does…in this case, under the command of Brig. Gen. William “Bull” Nelson (pictured). Until he dies a most unusual death later this year, Nelson will serve as one of the war’s most colorful characters. A huge man—300 pounds of muscle and bone—Nelson is notorious for enormous rages, which alternate with an overwhelming geniality. He had served in the navy during the Mexican War and began service in the Civil War commanding gunboats on the Ohio River. A native Kentuckian, Nelson rallied other Kentuckians to the Union side and in September 1861 was appointed a brigadier general in the army. Nelson’s troop transports will arrive at Nashville just as the first elements of Buell’s Army of the Ohio begin appearing on the north bank of the river. Without even being there, Grant has reached Nashville first. ELSEWHERE IN THE CIVIL WAR: Skirmishes occur in Missouri. At the White House, a simple funeral service is conducted in the East room for little Willie Lincoln, who had died four days before of typhoid. A bright boy, mature for his age, Willie was 11. 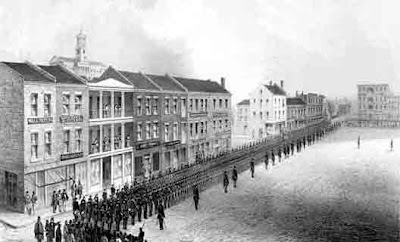 The streets of the Confederate capital of Tennessee are filled with rushing soldiers, men, and wagons, struggling to escape the city as Federal soldiers and gunboats approach. Losing Nashville will be a severe blow to the Confederacy, for it is the breakaway nation’s main supply depot and rail center in the Western Theater. The Confederacy’s eight largest city, it is also an important industrial center and one the agrarian South can ill afford to lose. 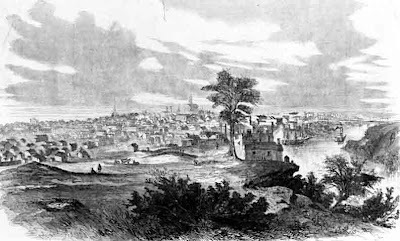 With Grant’s capture of Fort Donelson, downriver from Nashville on the Cumberland, the city can no longer be defended. Grant has punched a hole through the center of the Confederacy’s so-called “Kentucky Line”—once a nearly straight line of defiance, running from Arkansas to the Appalachians. Now Don Carlos Buell’s Army of the Ohio is descending on Nashville from the North. Federal gunboats are cruising the Cumberland. Grant’s victorious army is waiting ominously at Fort Donelson, where it captured 15,000 Rebel soldiers, and Confederate General Albert Sidney Johnston’s diminished army is split into two wings—one at Columbus, Kentucky, on the Mississippi River, the other at Nashville, but scrambling fast to get out. For reasons having to do more with army politics than winning the war, Maj. Gen. Henry W. Halleck has denied Grant’s plan to advance on Nashville himself. But with a cunning and a determination that belie his quiet, self-effacing manner, Grant comes up with a work-around. Imbued with the confident authority that comes from success in battle (and promotion to major general), he ignores department lines and orders two of Brigadier General Buell’s divisions, now near Paducah and separated from Buell, to advance on Nashville. These divisions had been ordered west to aid Grant’s attack on Fort Donelson, but had arrived too late. Grant co-opts them without asking Buell’s permission. Buell will arrive in Nashville the day after tomorrow to discover that Grant has beaten him to the punch—using Buell’s own men. However, Grant is content to let Buell take the limelight for entering Nashville, so long as the point is won for the Union. Now Grant hopes to make an advance of his own. Capt. Emerson Opdycke [pictured] of the 41st Ohio has a headache. Until yesterday, Opdycke’s regiments and others in Hazen’s Brigade were in steamboats “going up and down the [Cumberland] river,” killing time while awaiting orders. They had arrived too late to participate in the battle of Fort Donelson. Finally coming to rest at Paducah, Opdycke rushes off the boat and into a photographer’s studio. Because of all the fussing in the studio, Opdycke returns to his boat with a headache that “came near to sending me to bed.” By evening, he feels better about the picture, so he turns to fretting about something else. “I am sick of doing nothing, while others are doing so much. Our arms are winning glorious triumphs, which are but the beginning of the end of the rebellion,” he concludes, fearing he will lose out on the action. This evening. Grant himself writes his wife, Julia, to tell he has just learned he is being promoted to major general. “There is but little doubt but that Fort Donelson was the hardest fought battle on the continent. I was extremely lucky to be the commanding officer. Col. William B. Hazen, commander now of the 19th Brigade in Buell’s Army of the Ohio, has spent three months rusticating in a pesthole known as Camp Wickcliffe in Kentucky. As was common in army camps early in the war, Camp Wickcliffe was tormented by health problems, especially diarrhea and measles. A few days ago, Hazen’s brigade was shipped down the Cumberland River to join Grant’s siege of Fort Donelson, only to arrive after it was over. Hazen’s brigade came to rest at Paducah, while higher authority decided where to send it next. While at Paducah, Hazen met Brig. Gen. William Tecumseh Sherman for the first time. Sherman, until recently sequestered in a backwater of the water, has suddenly been elevated to command of the District of Cairo. He is both excited at this unexpected opportunity and regretful still about his emotional breakdown in November. “All I hope for is a chance to recover from the past,” he writes his wife, Ellen. He also tells her he just had “a long interview” with Brig. Gen. Simon Bolivar Buckner (pictured above), the fallen commander of Fort Donelson and a Union prisoner, being held on a steamboat anchored in the Cumberland River. ELSEWHERE IN THE CIVIL WAR: Although much of it will be scarcely remembered, there will be warfare in almost every corner of the United States. In New Mexico today, Confederates under Brig. Gen. H.H. Sibley drive the Federals under Col. E. R. S. Canby into Fort Craig., This is the battle of Valverde, named for a Rio Grande ford. This small battle included two remarkable events. At one point, Texas cavalrymen charged with lances. At another point, Union soldiers created an Improvised Explosive Device, consisting of a mule loaded with gunpowder. The mule was detonated and demolished, but no Confederates were harmed. In Washington, meanwhile, there is mourning for Willie Lincoln, the President’s son, who died of typhoid yesterday in the White House. Generals Grant, McClernand, and Wallace spend the day visiting Clarksville, Tennessee, which General Smith’s division has just occupied on Grant's behalf. This widens the notch Union forces have carved in northwestern Tenessee with the Forts Henry and Donelson campaign. Clarksville, McClernand wrote his wife, is a “beautiful village or town of 5 or 6000 inhabitants,” but almost completely deserted by its white residents. “We marched through the streets but met no welcome except from the negros,” the general wrote. Clarksville is strategically located on the Cumberland River, part-way between Fort Donelson and Nashville, the Tennessee capital. Confederate forces have withdrawn from Nashville, so Foote’s gunboats and Grant’s infantry could easily capture the city—if Maj. Gen. Henry W. Halleck, Grant’s superior, hadn’t forbidden it. Now Grant is forced to sit still and think about what he might do next. Grant’s campaign for Forts Henry and Donelson in Tennessee is a triumph, the result of his aggressiveness. Aggressiveness is an all-too-rare commodity among Lincoln’s generals at this early stage in the war. For some time, Grant’s buggy-eyed superior, Maj. Gen. Henry W. Halleck, had been sitting at his headquarters in St. Louis, as immobile as a frog on a lily-pad during a sunny day. But while Halleck temporized, Grant was hatching plans and training his soldiers. He was ready to take off in a flash when President Lincoln ordered that armies advance. Hence, the first great Union victories of the war, an ecstatic North, and the sudden fame of the previously unknown Grant. 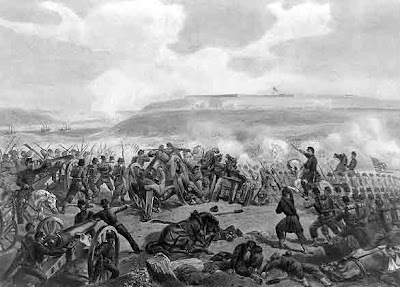 Today, while his army is processing 15,000 prisoners and cleaning up the mess after the Fort Donelson battle, Grant orders another advance—this by Brig. Gen. Charles F. Smith’s division. Smith is told to move east and take possession of the abandoned Confederate base at Clarksville, about half-way up the Cumberland River to Nashville. Once again, without orders or even a congratulatory note from Halleck about Fort Donelson, Grant is thinking ahead. Clearly, Gen. Albert Sidney Johnston (commander of the Confederacy’s Western Department) is vulnerable. With the loss of Forts Henry and Donelson, the center of his so-called “Kentucky line” has collapsed under Grant’s assault. His wings invite attack. Now Grant wants to advance against Nashville, Tennessee’s capital and a strategic and logistical center for the western Confederacy. He writes Halleck’s chief of staff that Nashville would be “an easy conquest.” But Halleck is engaged in a struggle with Washington to gain control over Brig. 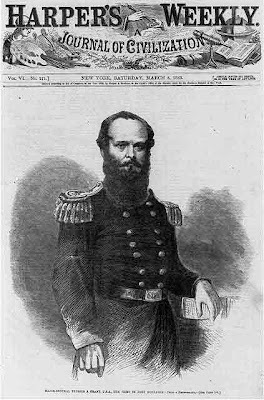 Gen Don Carlos Buell, with whom he now divides command of the Western Theater. He thinks Grant’s advance might imperil that. Grant is stunned when Halleck vetoes the Ohioan’s plan to take Nashville. Ironically, Halleck not only fails to gain control over Buell, but Buell snatches Nashville out from under Halleck’s nose. To the end of his days, Grant believed he could have ended the war in 1862 if he had been allowed to advance, destroy the armies of Johnston, and capture the western Confederacy. Grant’s reasons? He wanted to fight and believed he could win. Halleck’s reasons? His desire to advance his career. But while Halleck's wartime career will rise and fall, Grant's--like the man--will only advance. Ohio is amply represented Fort Donelson by its son, Brig. Gen.Ulysses S. Grant, but of the estimated 24,090 Union infantrymen present, only about 2,190 are Ohioans, distributed among four regiments. (Most of Grant’s army comes from Illinois.) Of the battle’s approximately 2,600 casualties (killed, wounded, or missing), only 19 are Ohioans. Ohio’s sacrifice will soon enough, however. In the meantime, Ohioans like Altman are excitedly writing to tell their families what they saw. “The 58th [Ohio regiment] charged bayonets on [the Confederates] and you ought to a seen them run over the [breastworks]. They went like deer,” wrote a proud Altman. Elsewhere in the vicinity of Fort Donelson, General Grant continues with the tedious follow-up work of battle. Perhaps the most dramatic incident of the day occurs when some Union soldiers gather around the jail in the nearby town of Dover, angry over what looks, at first glance, as if several of their fellows had been bound and gagged, then shot. The rumor spreads throughout the area, gathering so much force that it alarms Confederate General Simon B. Buckner. He quickly sends a message to General Grant, warning that fears are mounting that angry Union soldiers are threatening revenge to their Confederate prisoners. The situation at the jail is investigated quickly. It clearly appears that the four bodies there were NOT tied and, in fact, had been laid out for burial. They were fully clothed, their wounds bandaged, and showed no signs of abuse. They simply were combat fatalities whose fellow soldiers had placed the bodies in the jail to shelter them. End of story. All great battles are followed by…paperwork. At Fort Donelson, it is a day for mopping up after the Confederate surrender, and communiqués go out in all directions. Brig. Gen. Ulysses S. Grant, commander of the newly created “District of West Tennessee” (which his successful Forts Henry and Donelson campaign made possible) spends much of the day pumpingout orders. One of the first is a statement of hearty congratulations to his troops. Several dispatches concern the handling of his15,000 prisoners, which Grant believes represent “the largest capture …ever made on this continent.” He also requests supplies, especially blankets and overcoats to replace those his men lost on the battlefield or unwisely discarded during their march from Fort Henry. There is an order concerning the disposition of captured horses, mules, and other enemy property. (Commanders are to collect and guard all property until it is taken away by the proper officers, the weaponry to go to Grant’s ordnance officer, the horses, mules, and other stuff to the quartermasters). Guards are posted in all directions to prevent the escape of prisoners or a surprise attack by Confederates. The fleeing Confederate commanders, John B. Floyd and Gideon J. Pillow, arrived in Nashville, where some citizens, fearing a Union attack, prepare to flee, while others demand Confederate supplies stored in the city be opened to them. In Washington, Grant is proposed for promotion to major general. The North celebrates, the South worries. As they will again and again, some Northern newspapers rashly announce “The End is in Sight.” But the end will not come for three more years. ELSEWHERE IN THE CIVIL WAR: Brig. Gen. William Tecumseh Sherman writes “Dearest Ellen” from Paducah, while on his way to assume Grant’s former command, the District of Cairo. Only recently so doubtful about his ability to command, Sherman appears to be entering the combat zone without reservation. Yesterday, Brig. Gen. John A. McClernand’s division on the Confederate left had had a blow blasted through it by determined Rebel infantrymen. Grant arrived on the scene to find McClernand’s forces in shambles. He then ordered Brig. Gen. Charles F. Smith to attack the Confederate right at Fort Donelson. “I will do it, General,” said Smith without hesitation, and he personally led the charge on his horse, his ample moustaches streaming out in the breeze. Seeing some of his falter, he barked, “Damn you, gentlemen, I see skulkers. I’ll have none here! Come on, you volunteers, come on! This is your chance! 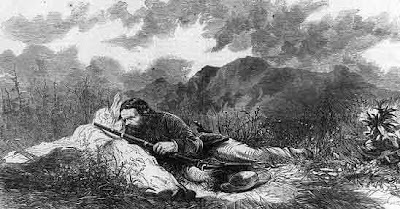 You volunteered to be killed for love of country, and now you can be!” Smith was stopped short of the fort itself, but was able to occupy some of the Confederates’ outer works. With the whipping of McClernand’s troops, the Confederates had an escape hatch which, amazingly, they did not use. Dismayed by Smith’s attack, fearful Union gunboats would return, and thinking they would soon be overwhelmed, Confederate commanders met last evening to agree to surrender in the morning. But during the night, two of those commanders were planning their own escapes, leaving many of their troops—and Brig. Gen. Simon B. Buckner—behind. Nathan Bedford Forrest had been given authority to attempt a breakout, with fighting, if necessary—far on the Confederate left. Leading his horsemen and accompanied by a number of infantrymen, Forrest discovered that the area wasn’t guarded by Grant’s men, and he was able to escape and one of the war’s legendary cavalry commanders. Meanwhile, Floyd and his staff slipped across the Cumberland River in a small boat and when two Confederate steamboats arrived Pillow commandeered them and was able to escape to Nashville—steaming furiously to escape possible pursuit. This was termed “A Disgraceful Surrender” by modern military historian Kendall D. Gott in his 2003 analysis of the Fort Henry, Fort Donelson campaign, Where the South Lost the War. But what happened made Fort Donelson the first glorious victory for the North and Grant its first hero. Yours this date…just received. No terms except unconditional and immediate surrender can be accepted. I propose to move immediately upon your works. Buckner capitulated in a grumbling reply that he would “accept the ungenerous and unchivalrous terms which you propose. 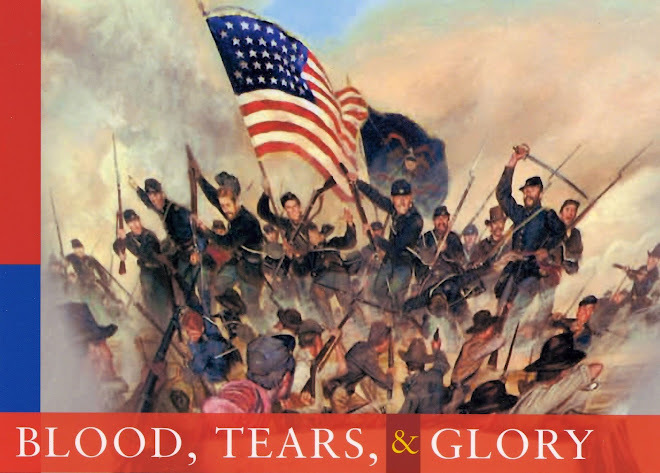 Fort Donelson was a stunning victory: an estimated 15,000 Confederate soldiers surrendered. It is about 5 o’clock on a cold February morning, with most of Grant’s shivering troops arrayed outside Fort Donelson and trying to sleep, when suddenly shots ring out on the Confederate left. Confederates are pouring from the fort to attack Union Brig. Gen. John McClernand’s division, which forms the right side of the encircling Union army. Confederate Brig. Gen. Gideon Pillow’s division, bolstered by a second division, is trying to fight its way out and escape in the direction of Nashville. Pillow’s men succeed in fighting their way through the surprised Union soldiers, but then comes another surprise. Brig. Gen. John B. Floyd, Fort Donelson’s commander and Pillow’s senior, orders the troops to return to the fort! The escape was planned last night by Pillow, Floyd, and Fort Donelson’s third in command, Brig. Gen. Simon B. Buckner—the only one of the three generals who knew what he was doing. Although the fort had beaten off yesterday’s gunboat attack, other gunboat attacks were feared and so was the Union army, of unknown size, that was massing outside the breastworks. The Confederates did not feel they could withstand either a massive attack or a long siege. Grant had gone downriver to meet with Flag Officer Foote (who had been wounded and could not come to Grant). Now Grant came rushing back. He ordered Brig. Gen. Charles F. Smith to attack the Confederate right while McClernand’s division, bolstered by a newly arrived third division led by Brig. Gen. Lew Wallace, plugged the gap Pillow had opened. And so the Confederates’ escape hatch was closed. (Wallace, who would become more famous for writing Ben Hur than for his generalship, had been left behind at Fort Henry, but now a worried Grant summoned him and gave him 11 infantry regiments and a battery of light artillery. Among Wallace’s regiments were the 58th, 68th, and 76th Ohio who would, however, see only limited action in this fight). This evening sees another meeting of the three Confederate generals and they agree to surrender the fort. Floyd, an incompetent “political general” and Pillow, a West Point graduate of no great ability, are senior to Buckner. Floyd, Buchanan’s secretary of war, fears treason charges if he’s caught, and Pillow just wants to escape. They agree to slip away by themselves and leave Buckner holding the bag, along with most of their troops. Somehow, the perpetrators of the South’s “Lost Cause” mythology forget to mention this spineless behavior by their generals. ELSEWHERE ON THE BATTLEFIELD: While the soldiers rest and the Confederate generals confer, Mary Alice Bickerdyke, gratefully called “Mother” by the soldiers, roams the battlefield, ministering to the wounded and making sure no one is left behind. Born in Ohio, later an Indianan, Mother Bickerdyke is a self-appointed angel of mercy who irritates stuffed-shirt officers but is idolized by the soldiers. Today is the navy’s day to show what it can do in reducing Fort Donelson. 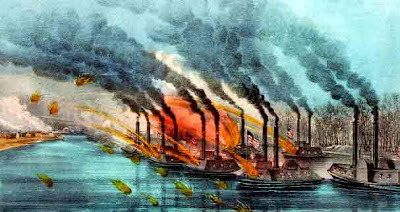 Fresh from his success in overwhelming Fort Henry in little more than an hour, Flag Officer Andrew Hull Foote has brought his little fleet of four ironclads and two timberclads chugging up the Cumberland River to pound the daylights out of the Confederate fort. On the land side, meanwhile, the armies are relatively static. They are waiting for the outcome of the artillery duel. Fort Donelson presents a very different problem than Fort Henry did. Well-situated on bluffs overlooking the river, the fort boasts two “water batteries”—that is, artillery that could be aimed at anything that moved on the Cumberland. Things do not go well for Foote’s gunboats. While doing little damage to the Confederate batteries, all four Union ironclads are badly damaged by the pounding, plunging fire of the Confederates. The gunboat St. Louis alone takes 59 hits in a battle lasting only 90 minutes. Two of the Union gunboats drift helplessly away, their steering gear smashed. The two timberclads are far more vulnerable to damage, so they dare not take on the Confederate artillerists by themselves. More than 50 Union sailors are killed or injured. Even Flag Officer Foote is wounded by enemy fire. Beaten, the little squadron moves down the river and out of range. The naval attack had failed. Now everything is up to Grant’s shivering soldiers, shivering in the snow and cold. The Confederates are just as cold and both sides are poorly supplied. Despite the thrashing of Foote’s gunboats, the Confederate generals doubt they can mount a protracted defense. They meet this evening and plan an attempted breakout in the morning. IN OTHER NEWS: The last Confederates leave Bowling Green, Kentucky, without a fight, abandoning the important base to the Federals. 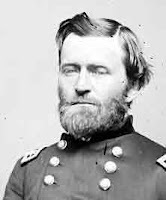 As if to acknowledge that Ulysses S. Grant had moved into a new theater of operations, he was today named commander of the District of West Tennessee—which is where he was, anyway, thanks to his Fort Henry/Fort Donelson campaign. Replacing him as commander of the District of Cairo will be Henry W. Halleck’s friend, Brig. Gen. William Tecumseh Sherman. Halleck had promised the downhearted Sherman—currently organizing and training troops at Benton Barracks in St. Louis—that he “would not be forgotten,” and is good as his word. Estimates vary on the number of troops facing each other at Fort Donelson on this spring-like morning: perhaps 15,000 or more Union troops outside the forts’ works; perhaps 16,000 inside the fort. Halleck is forwarding still more troops, who have yet to arrive. “Birge’s Western Sharp-Shooters” were awake and moving about before dawn. (Pictured above: a typical sharpshooter in action, but not of Birge's force) The sharpshooters were what we call snipers, an elite force specially trained in stealth and marksmanship—ancestors of today’s Special Forces. Birge's force was the Western Theater's counterpart to the more famous "Berdan's Sharp Shooters," attached to the Army of the Potomac. Still not a complete regiment, Birge’s force includes companies recruited from several western states, including one organized at Dayton, Ohio. Two more Ohio regiments will eventually join Birge's force.. According to Lew Wallace writing after the war, each sharpshooter carried a special long-range “deer rifle” (the “Henry Rifle”) and operated independently. This morning, after officers made sure their men’s canteens were full and they had a day’s supply of “crackers” (hardtack), the men were told, “All right; hunt your holes, boys,” and they scattered, concealing themselves behind stumps, in trees, or in holes they dug themselves. The members of Birge’s elite were colorful to look at: instead of a regulation bullet case, they carried a bearskin pouch holding bullets they molded themselves. Although Birge's men had to wear regulation uniforms, their headgear was a gray “sugar-loaf affair,” with three squirrel tails running from front to back, meeting at the top of the crown. Nicknamed the “Squirrel Tails,” the sharpshooters were commanded by Lt. Col. John M. Birge, from St. Louis. 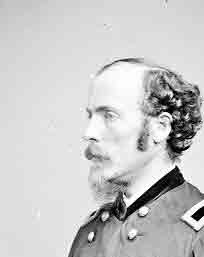 In early afternoon, although Grant had ordered nothing be done to bring on a general engagement, an impatient Brig.Gen. John A. McClernand—a “political general” with limited military experience—ordered repeated, failed attacks on a Confederate battery. However, the attacks may have concealed the weakness of Grant’s force. Afternoon also brought a painful change in the weather, from spring-like to cold, sleet, and snow. Troops who had thrown away their blankets and warm clothing on the march from Fort Henry now were ill-prepared for harsh weather, and suffered greatly. As night fell, Grant’s shivering soldiers were settling down to conduct a siege. It appeared they lacked the numbers to attack the fortification head-on, for the usual rule of thumb was that the attacking force needed three to five times--if not more--as many men as the defenders. It is a cardinal rule in warfare, however, that nothing ever goes exactly as planned—nor would it here. By 8 a.m., Ulysses S. Grant’s troops have begun marching towards Fort Donelson, 12 miles away. Rain and mud delayed their departure by two days, but now the roads are firm enough for thousands of men and hundreds of horses—and Grant dares delay no longer. One reason is that Grant wants to attack before Confederates have brought in too many reinforcements. But another is that Grant’s superior, Maj. Gen. Henry W. Halleck, is a nervous Nelly who at any moment could order a halt to Grant’s advance. Halleck has been feeding reinforcements to Grant without an explicit yay or nay about Donelson, but he has also indicated he’d prefer Grant remain at Fort Henry. It looks like a CYA maneuver by Halleck: if Grant takes Donelson, Halleck can share in the glory of the attack; if Grant fails, Halleck can point to his advisories against it. So, lacking clear orders one way or the other, Grant puts his head down and pushes ahead. After traveling about five miles, Grant’s troops are slowed by Nathan Bedford Forrest’s cavalry. Next comes plunging artillery fire. By nightfall, however, McClernand’s and Smith’s forces are camped on a high ridge facing Fort Donelson’s outer works. The roads they had left behind, however, are littered (according to a Union major) with the “coats, pants, canteens, cartridge boxes, bayonet scabbards, knapsacks…all sorts of things that are found in the army." Grant’s inexperienced soldiers are discarding things they will need later. Feeling cocky after Fort Henry’s easy victory, these soldiers will soon encounter two challenges: an unexpected winter storm and a stout defense by Donelson’s defenders. In a “council of war” aboard the steamboat New Uncle Sam, docked at Fort Henry in northwestern Tennessee, Brig. Gen. Ulysses S. Grant sits and smokes silently, “but never said a word,” one of the generals—Lew Wallace (right)—later recalled of the meeting, called to plan the attack on Fort Donelson. “In all probability he was framing the orders of march which were issued that night,” sniffed Wallace, who considered the meeting “a convocation” and not a traditional council, wherein give-and-take was expected. At home on furlough in Ohio since February 4, Lt. Col. Rutherford B. Hayes finally emerges to pay a visit in Columbus to visit his brother-in-law. In Washington, President Lincoln listens to a stenographic report of testimony given in the case of Gen. Charles S. Stone of Massachusetts, suspected of treason in connection with the debacle at Balls Bluff last October. Sen. Benjamin F. Wade of Ohio, chairman of the Committee on the Conduct of the War, is one of the bloodhounds dogging General Stone; War Secretary Edwin M. Stanton, also of Ohio, is another. However, most of Lincoln’s day is devoted to his deathly ill son, Willie, and son Tad, now ill as well. The White House reception usually held on Tuesdays is cancelled for this reason. Slowly—very slowly—the northern giant in this Civil War is beginning to stir after months of somnolence. In northwestern Tennessee, Brig. Gen. Ulysses S. Grant continues organizing his advance on Fort Donelson, now two days behind schedule—not for lack of aggressiveness on Grant’s part, but because of weather conditions. In Washington, though distracted by family illness, President Abraham Lincoln continues to ponder how to get McClellan’s Army of the Potomac on the move. On the other hand, the commander of the Union’s biggest eastern army, Maj. Gen. George B. McClellan, ponders what to do when—McClellan believes—he is outnumbered by Confederate troops at Manassas, Virginia. If McClellan wants to find a way to get around the Confederates, he wants even more to get around Lincoln and do what he, McClellan, thinks is the way to run a war. On Johnson’s Island, near Sandusky, Ohio, on the coast of Lake Erie, workmen are completing construction of a prison camp designed especially for officers. At the moment, many Confederate officers and enlisted men and even some civilians who have been captured in the Western Theater, are being held in one corner of Camp Chase, the big Federal training and staging area near Columbus, Ohio. But Federal authorities want to separate officers and their soldiers, thinking enlisted men without their usual leaders will be less apt to cause problems for their captors. From the winter quarters of the 21st Ohio in Kentucky, brothers Addison and Alfred Searles write short letters (dated February 10) to their family in Huron County, Ohio. The brothers say they have almost nothing to write about to write about and (in Addison’s words) “think that we will stay here for some time yet.” It’s one boring day after another in this man’s army. Then, “one of the boys” rushed into Caldwell’s tent with the news that the next morning they would strike their tents and start marching. “The boys” weren’t told where they were going, but they will learn soon enough that they are advancing on the big Confederate military base at Bowling Green, Kentucky. Hurrah! “The boys” are eager for action. And in North Carolina, Brig. Gen Ambrose Burnside’s soldiers win a battle at Elizabeth City and are gaining firm control of a chunk of this Confederate state’s coastal area. Union navy vessels destroy North Carolina’s “Mosquito Fleet” of five small vessels. Having gained this foothold to use as a staging area, the question now is far inland Union forces will go. Will it be possible—as hoped—to attack Richmond, Virginia, from the south? The most important people in the life of Brig. Gen. Ulysses S. Grant are his wife, Julia Dent Grant, and their four children. They form his snug harbor of safety, support, and love. Throughout the war, he will bring them to live at his headquarters whenever it is safe to do so. Grant’s family has been living with him at Cairo, Illinois, headquarters of his District of Cairo, but now that the general is on the warpath, Julia and the children are about to leave the war zone and join Grant’s mother, father, and sister in Covington, Kentucky. Grant’s mother and father are two pieces of work with whom the general has an uneasy relationship. His mother is a strangely silent monolith, a brooding presence who seems to live in her own world, neither reachable nor reaching out. Father Jesse (above, right) is one of those hard-headed, hard-shell strivers with whom nineteenth-century frontier America abounded, a man who expects to use his son’s position for his own benefit and who does not hesitate to complain to Ulysses about the conduct of the war. It can be safely assumed that words of praise from either parent are rare. You have no conception of the amount of labor I have to perform. An army of men all helpless looking to the commanding officer for every supply. Your plain brother however, as yet, had no reason to feel himself unequal to the task and fully believes that he will carry on a successful campaign against our rebel enemy. I do not speak boastfully but utter a presentiment. The father is so unwilling to credit his son that perhaps the son feels the need to make a statement to home base on his own behalf. 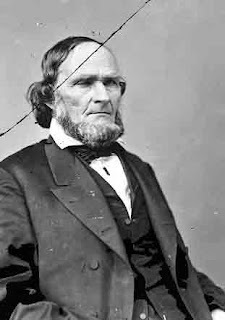 ELSEWHERE IN THE CIVIL WAR: The Joint Congressional Committee on the Conduct of the War, headed by Ohio Sen. Benjamin F. Wade, interprets its oversight role broadly and has a tendency to interfere or raise suspicions more out of war-time anxiety than real evidence. Eager to fix blame for the Union debacle at Balls Bluff, Virginia, last October, it recommends the arrest of Brig. Gen. Charles F. Stone on suspicion of treason. On War Department orders, Stone will be imprisoned for 189 days without charges or trial, then released without explanation. To this day, Stone’s imprisonment stands as an example of the injustices and violations of civil rights that can occur because of war-time paranoia. There is also the question of whether Halleck approves of Grant’s Donelson venture. Halleck’s original orders to Grant said nothing about Donelson, telling him only to “take and hold” Fort Henry. Nor, until two days ago, had Grant ever indicated—in telegraphic and written communication—any intention to do otherwise. Herein lies one of the small mysteries of the Civil War, with hints of personality differences peeping through. Halleck is the quintessential desk soldier—known throughout the army as “Old Brains,” a man who knows everything there is to know about warfare but lacks the urge to actually conduct it. He is cranky, overly cautious, and a micro-manager. Grant’s quiet façade conceals a relentless aggressiveness that will, in time, win this war, but at the moment manifests itself in a determination to strike and strike again at the enemy. It looks as if President Lincoln’s “General Order Number 1” has given the impatient Grant license to charge ahead. Since the beginning of this campaign, the tone of his wires to Halleck has been assertive, almost defiant, as if to dare Halleck to try to stop him. While the published records suggests this is technically true, the records also indicate Halleck was quite aware of the Donelson move and even ordered troops to support it. But his caution kept him from committing himself to Grant in writing and his jealousy prevented sending of congratulations or even encouragement. In his excellent study of Grant and Lee (Grant and Lee: A Study in Personality and Generalship), British Maj. Gen. J. F. C. Fuller wrote in 1957 that “the supreme value of military history is to be sought in the personalities of the generals who shaped them. At base, seven-eighths of the history of war is psychological.” That was certainly true in the cases of Grant and Halleck. At this early stage of the war, Brig. Gen. Ambrose E. Burnside of Rhode Island is doing well, belying—so far—history’s poor opinion of him. In October 1861, Burnside got the go-ahead for his plan to organize a special division of troops to attack the Confederacy along the Atlantic coast. Aboard a fleet of 65 transports, escorted by warships, Burnside entered North Carolina’s Pamlico Sound and yesterday landed 7,500 troops on Roanoke Island. Today he defeated a Confederate force and took, 25,000 prisoners as well as inflicting 150 other casualties while suffering fewer than 300 himself. What was a glorious start to a campaign that could eventually take the Confederate capital of Richmond is largely forgotten—because it did no such thing. There is little time for Grant to savor the capture of Fort Henry (pictured above: Fort Henry the day after its surrender). After looking over Fort Henry, Grant and his staff, escorted by some cavalry, reconnoiters his next target, Fort Donelson. He approaches within a mile, scopes out the surrounding terrain, thinks about the fort’s commanders (of whom he had a low opinion), and tells his staff he expects no serious opposition if they move quickly. Fresh from their capture of Fort Henry, Union gunboats go chugging up (south) on the Tennessee River, deep into enemy territory, to see what trouble they can cause the Confederacy. Meanwhile, Grant’s telegraphed declaration that he will take Fort Donelson next hangs in the air, awaiting Halleck’s reply. Will the ever-cautious Halleck agree or disapprove before Grant begins his advance tomorrow? At about 11 a.m. this morning, Union Navy Flag Officer Andrew Hull Foote’s four ironclads and three wooden gunboats moved upstream on the Tennessee River. When the ironclads had reached a point about a mile from Fort Henry, Foote arrayed them side by side in a row, with the three timberclads about a half mile back. Then, on his own, Foote began rapid fire into the fort, the timberclads firing over the ironclads in front of them. For slightly over an hour, the Confederate artillerists fought back, scoring several hits, the most serious of which pieced the Essex’s boiler, scalding 28 sailors. Meanwhile, Brig. Gen. Ulysses S. Grant’s 15,000 soldiers were still struggling through muddy, swampy, rain-soaked brush land to reach the fort. The plan had been for simultaneous water and land attacks, but Hull chose not to wait. Fort Henry was a low, five-sided earthen structure, built on ten acres of swampy ground and exposed to flooding from the river. It mounted 17 heavy guns, but high water and lack of ammunition left only 9 guns to guard against a water approach—and even these guns were handicapped by their low elevation. Having already decided he was badly outnumbered, shortly before the bombardment began the fort’s commander, Brig. Gen. Lloyd Tilghman, had evacuated most of his troops. He sent them cross country to Fort Donelson, a stronger fortification on the nearby Cumberland River, about 12 miles away. 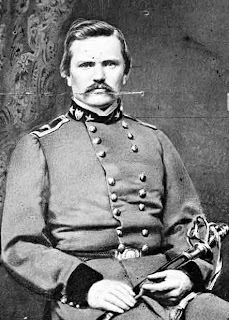 Tilghman himself chose to remain in Fort Henry, retaining only some artillerists to attempt delaying Union pursuit of the fleeing Confederate infantrymen. Artillery fire from both the gunboats and the fort was accurate, with the Confederates scoring 59 hits on the Union vessels, although most did minor damage. However, one shot pierced the Essex’s boiler, scalding 32 men, and several of the fort’s artillery pieces were damaged. After an artillery duel lasting slightly more than an hour, with Union fire sweeping the fort, Tilghman and about a hundred men surrendered. Foote had to send a boat into the fort to arrange the surrender. Grant’s infantrymen arrived about an hour later, no longer needed for an assault. Most of the fleeing Confederates reached Fort Donelson safely. Grant and his officers met and agreed they should attack Fort Donelson next, and do it quickly. It was the first important Union victory of the war and it was won in the West under the leadership of Brig. Gen. Ulysses S. Grant. It pried open one of the Confederacy’s back doors, exposing critically important Tennessee to increasing Union pressure—but at the time few realized how important the Fort Henry and Fort Donelson campaign would prove to be. ELSEWHERE IN THE CIVIL WAR: In Kentucky, Col. William B. Hazen, acting commander of the 19th Brigade in Don Carlos Buell’s Army of the Ohio, issues yet another of his many orders. Hazen, an absolute bear for perfection in all things military, declares, “Colonels of regiments will at once see that all officers in their commands, field and staff, sutlers and retainers around camp, are fully instructed in the division and brigade orders pertaining to ht police and discipline of the camp…..” In other words, tuck in your shirt, cut your hair, pick up trash, and jump when ordered. From Benton Barracks in Missouri, Brig. Gen. William Tecumseh Sherman, writes his former commander in Kentucky, Brig. Gen. Robert Anderson (the “hero of Fort Sumter”), that he has been busy organizing and sending out regiments to join various armies, but now Maj. Gen. Henry W. Halleck “promises me a command soon. I never did want to play a part in this war but want to do all in my power.” Apparently, Cump is recovering from his emotional break in Kentucky.